If you’re looking for an artistic statement that makes very good coffee, the De’Longhi Nescafe Dolce Gusto Eclipse Touch is the only one of its kind. The De’Longhi Nescafe Dolce Gusto Eclipse Touch is truly a one of a kind coffee capsule machine which is simple to use and makes great coffee. You will pay the price for design, however. See also Nespresso Krups Prodigio review. De’Longhi designed coffee machines have always lingered behind the refinement of Nespresso or smooth, simplicity of Bosch. Its reputation is chunkiness and no creativity. 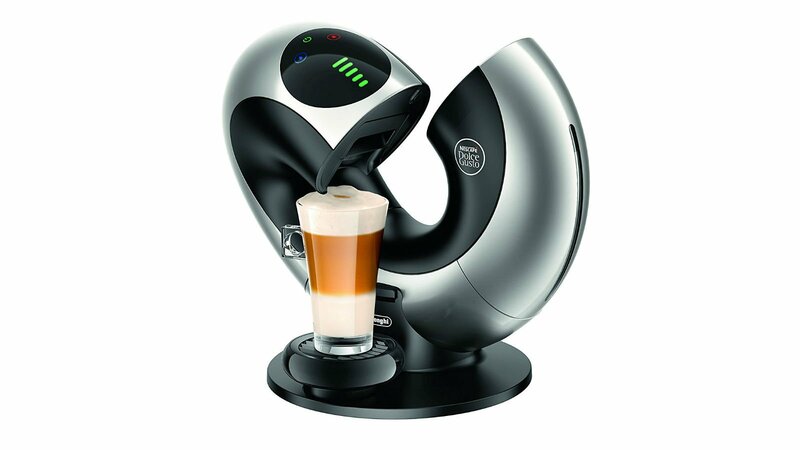 However, its Nescafe Dolce Gusto Eclipse Touch model has propelled itself way ahead of its competitors in terms of unique, out-of-the-box design. Styled as a loop that opens into a twisted shape at the touch of a button for use, the De’Longhi Nescafe Dolce Gusto Eclipse is just as much an artistic statement for the kitchen as it is a coffee capsule machine. Available in the simple colours of black or silver, the designers of this machine have ensured it will work with any décor. However, its 27 x 33 x 32 cm dimensions mean its anything but unobtrusive. But if you’re paying top price for such a stand-out machine, why would you want it to blend into the background? See also: Krups Nespresso Expert Coffee & Milk Machine review. Another nice addition is the touchscreen interface with bars to set the coffee quantity and choice of hot or cold drinks; one of De’Longhi’s trademark features it has over competitors. Additionally, when turned on, the machine opens automatically which any coffee machine enthusiast will find entertaining. Sadly, and strangely, it doesn’t automatically close when turned off. See also: The BEST capsule coffee machines of 2017. Finally to note is the colour of the power cord. designers of the De’Longhi Nescafe Dolce Gusto Eclipse have opted for a bright red cable which doesn’t seem to match with the machine itself. They’ve highlighted the one aspect of a coffee machine most people want to try and hide. Unless you are very skilful at tucking the cord out of sight, it really does take away from the sophistication and artistic design of the unit, and will instead draw attention to the messy, bundled up cable behind it. As we move into 2017, if a coffee capsule machine isn’t easy to use, then it isn’t worth buying. The market has progressed so far now that coffee should be made with the least amount of effort needed. This machine lives up to the expectation. Simply fill the water tank, pop in a Nescafe Dolce Gusto pod, choose your water volume (including a new XL function for long drinks), hot or cold and you’re away. See also: The BEST Coffee Machines of 2017. Additionally, as with most De’Longhi coffee capsule machines, there is no milk chamber. This is because there are separate pods which contain the milk and are as easy to use as the coffee pods and means no mess. However, some people may not like using non-fresh milk and it will also be an added cost. As with all coffee capsule machines these days, cleaning is also very simple with a descaling option built into the machine and a removable drip tray. Where De’Longhi has always impressed is with the quality of its coffee and the Nescafe Dolce Gusto Eclipse continues that reputation. With a 15 automatic pressure regulation, your coffee is guaranteed to be smooth with a thick crema, every time. De’Longhi also offers one of the widest range of hot and cold drinks for capsule machines on the market. There are over 40 drinks varieties and strengths to choose from long black Americano to frothy soy Latte Macchiato, Hot Chocolate to Peach Tea. See also: Best De’Longhi Coffee Machines 2017. About a third of the £169 price tag for the De’Longhi Nescafe Dolce Gusto Eclipse is purely for its looks. There are several cheaper De’Longhi and other models available that will make just as good coffee with similar functionalities and features. However, this truly is a stunning and industry-leading design, tainted somewhat unfortunately by its red power cord. De’Longhi have paved the way for a new generation of uniquely-designed coffee capsule machines with its Nescafe Dolce Gusto Eclipse. If you want your machine to stand out instead of fitting in, while making high-quality coffee, this is the perfect unit. But if you are more interested in the coffee, and would rather a machine that will blend in with other appliances, there are cheaper machines of the same quality available. Not quite what you’re looking for? Head to Amazon.co.uk to browse current Coffee Machine deals.